That particular issue sounds like a condensed version of the epic shoot ’em ups of the late 1930’s. All the Thrilling titles cut down the scope of their lead novels as the 1940’s moved into the second half. I remember picking up a ’46 or so issue with a story about diamonds. In it the Phantom is called in. After his briefing he disguises himself as a police detective who then solves the case without ever having to alter his makeup. I know I enjoyed reading the yarn. But I felt a bit cheated. 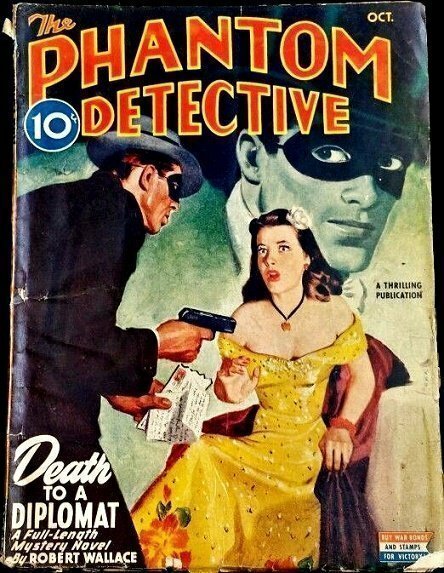 My guess is that the editors grabbed some novel in their inventory and grafted the Phantom on to the front end.